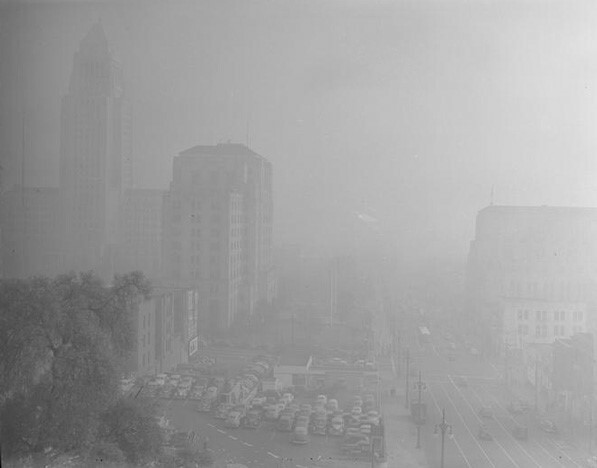 (1948)** - L.A. Civic Center masked by smog on January 6, 1948. 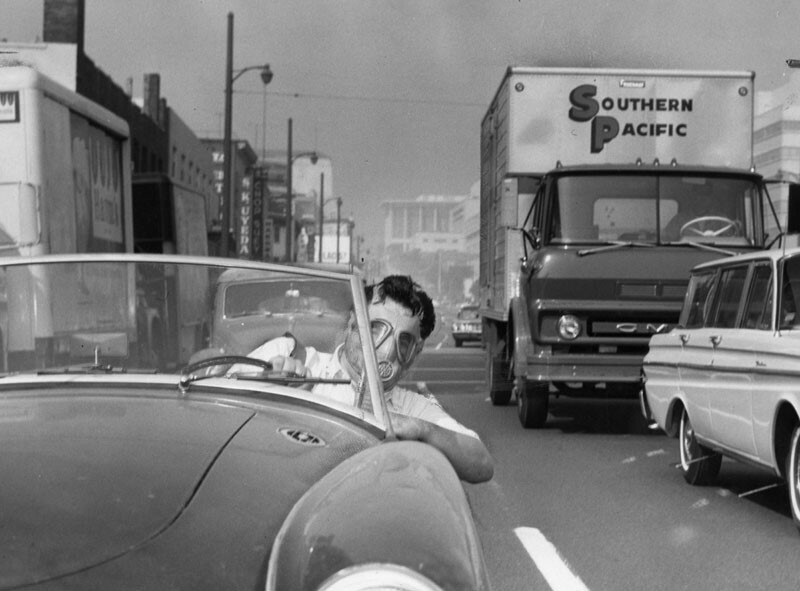 Courtesy of UCLA Library Special Collections - Los Angeles Times Photographic Archive. 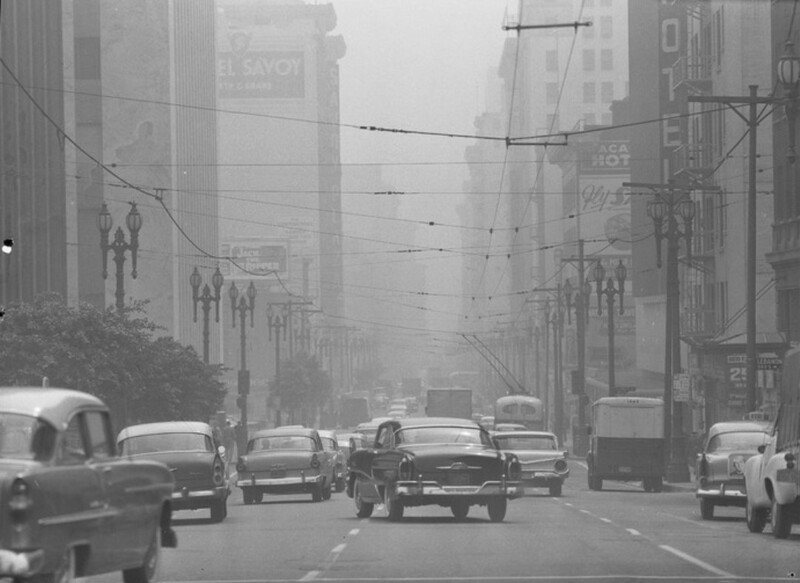 (1940)* - BEFORE SMOG CHECKS - Three cars are seen here heading east on Hollywood Boulevard with smoke billowing out of their tailpipes. 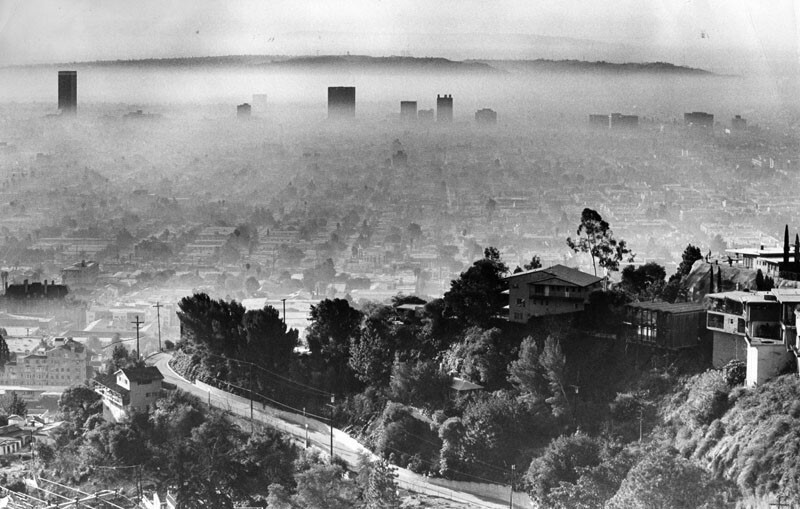 The first California “Smog Check” program wasn't implemented until 1984. 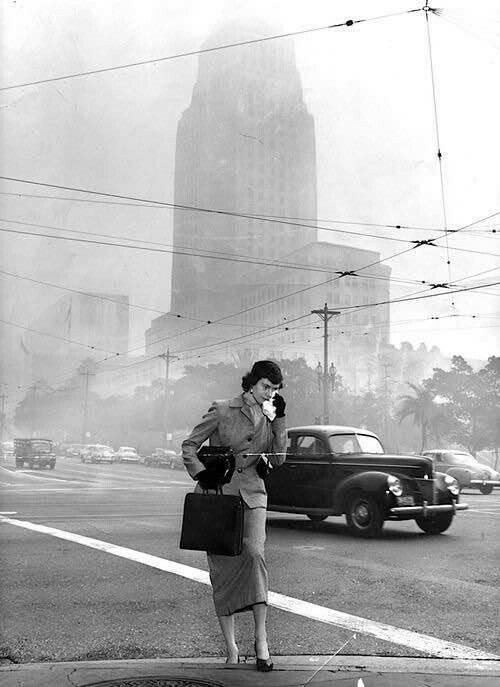 (1940s)+^ - A woman is seen wiping her eyes as smog blankets Downtown Los Angeles. 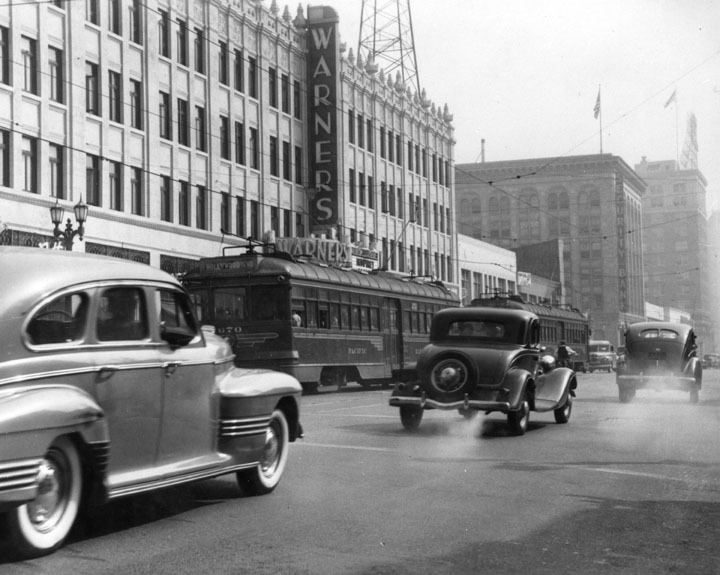 Massive wartime immigration to a city built for cars had made L.A. the largest car market the industry had ever seen. 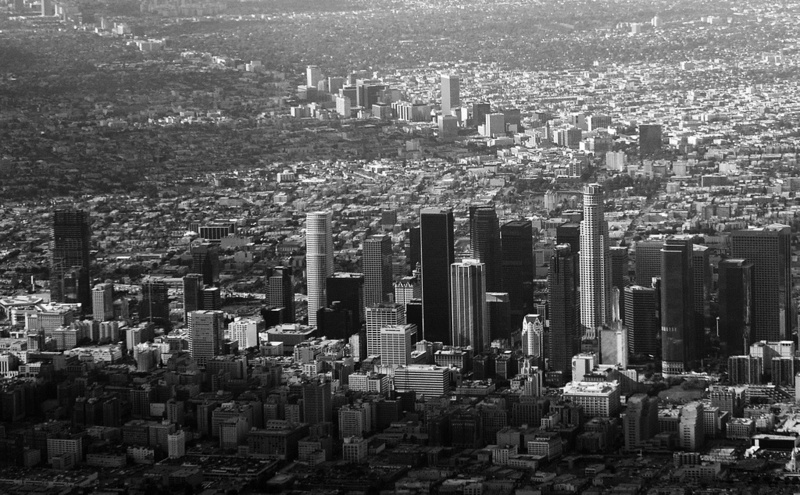 But the influx of cars and industry, combined with a geography that traps fumes like a big bowl, had caught up with Angelenos. 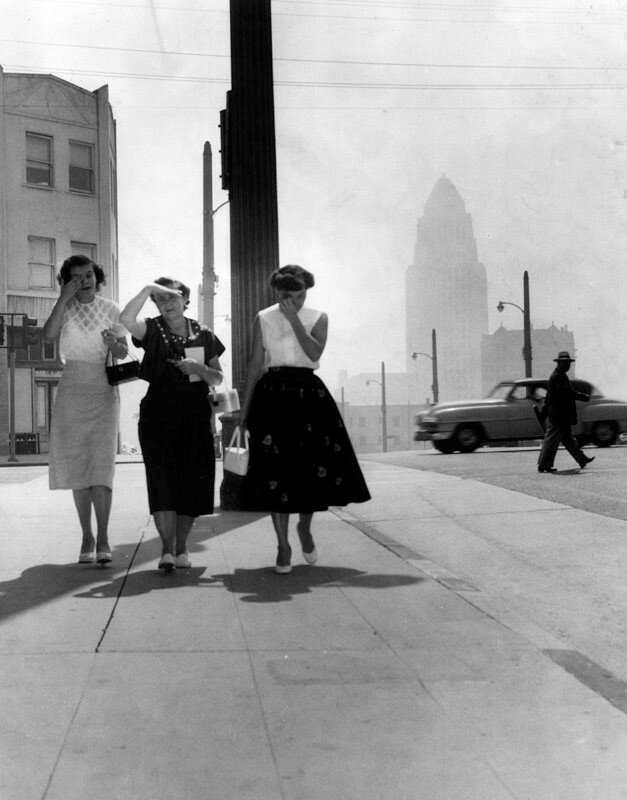 (1955)* - Three women on a downtown Los Angeles sidewalk are troubled by the eye-irritating smog. City Hall is barely visible in the background. Photograph dated Septmber 14, 1955. 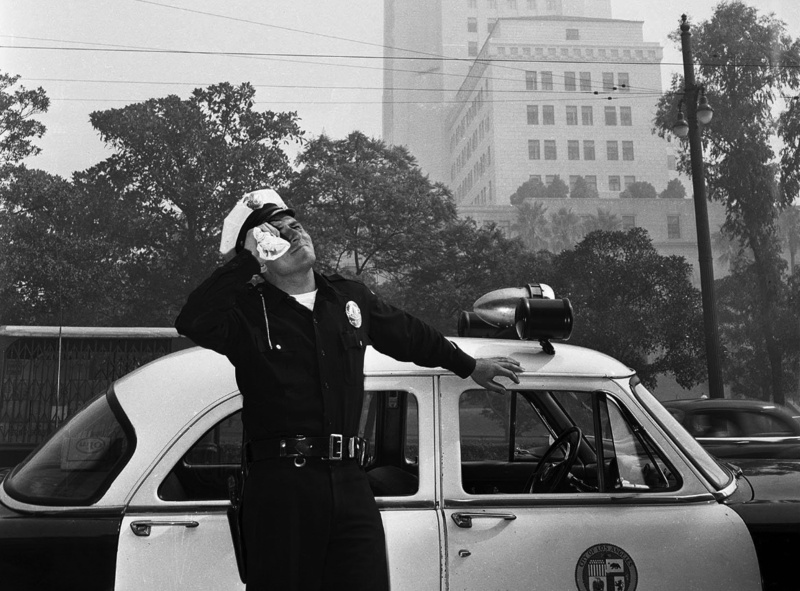 (1955)#* - LAPD officer wiping his eyes due to the smog, with City Hall in the background. (1957)* - Outdoor view of a residential incinerator burning trash. Photo dated July 1, 1957. Until the late 1950s most people burned their trash in their own backyards using incinerators similar (but smaller) to the one seen above. 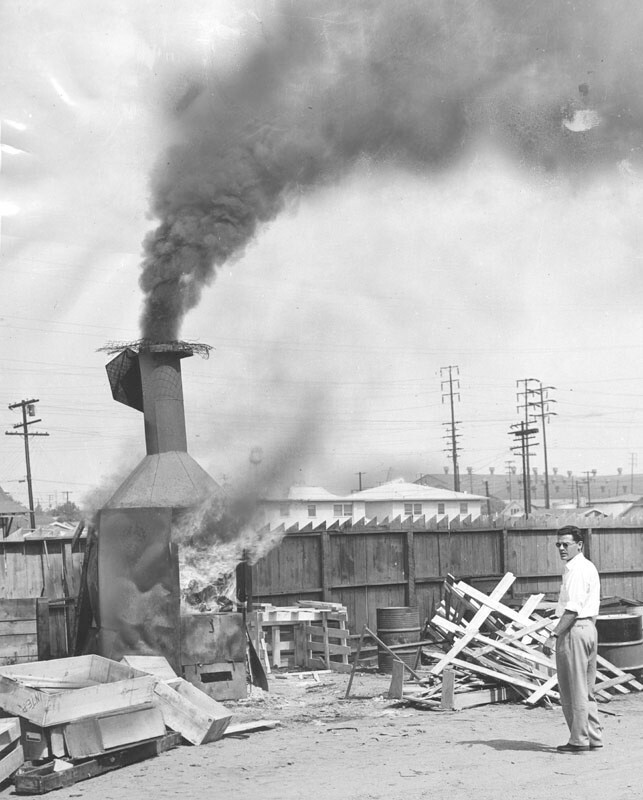 All refuse burning in Los Angeles ended October 1, 1957 when Air Pollution Control District's ban on residential incinerators became effective. 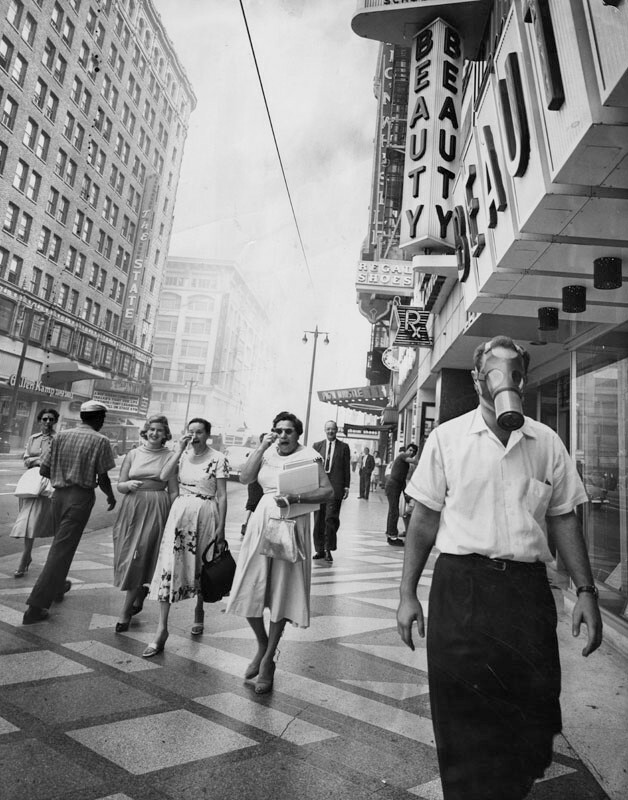 (1958)* – Photo caption reads: “Man at right defies convention and eye-searing pollutant as he strolls down Broadway wearing a gas mask, as Los Angeles battles another smog attack. Women on left suffer and use their handkerchiefs to wipe away their tears.” Photo dated: September 19, 1958. Automakers were slow to respond. They were wary of any change that would add cost to their vehicles. As a result of public pressure, emission regulations would come to pass. But, it would take another two decades for things to change. (1964)* - View looking south as seen from the Hollywood Hills showing the Wilshire corridor at top of photo with Baldwin Hills further back. 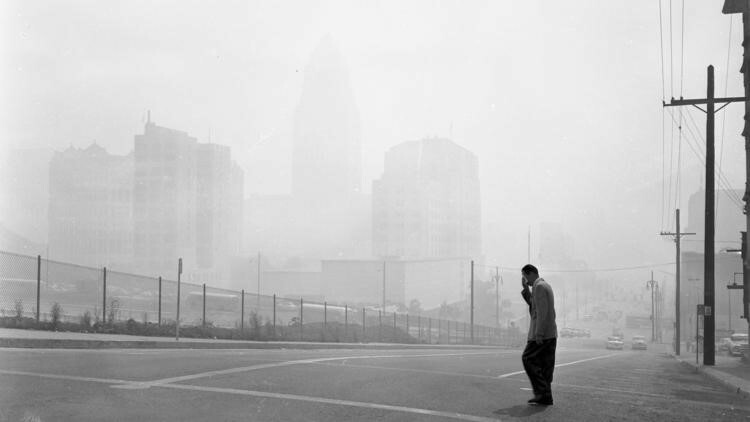 (1960)** - A smoggy day in Los Angeles. View is looking north on Figueroa Street in downtown Los Angeles. 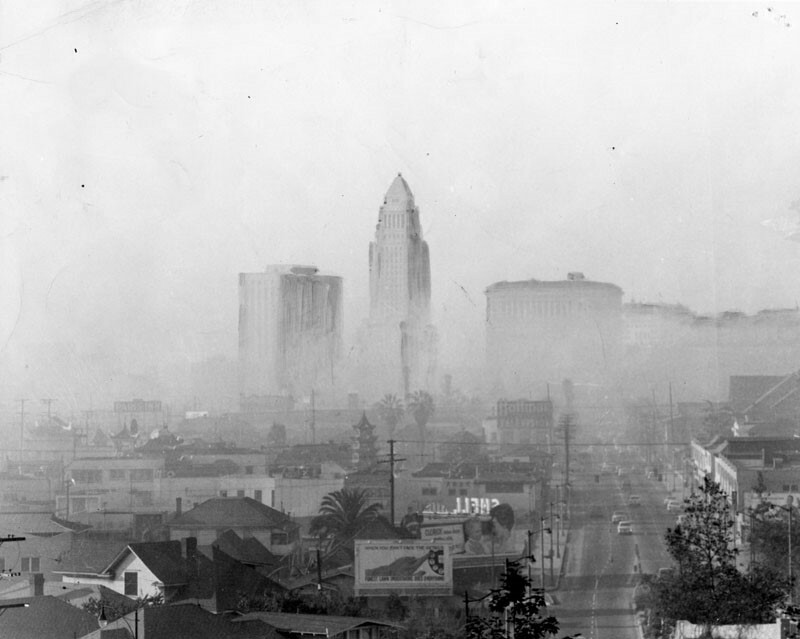 (1968)* - Smog-shrouded view of downtown Los Angeles, looking toward City Hall and the Hall of Justice, on October 7, 1968. (1986)* - View of Spring Street looking south from 3rd Street at 3 p.m. on an unidentified day in November 1986, using infrared film. 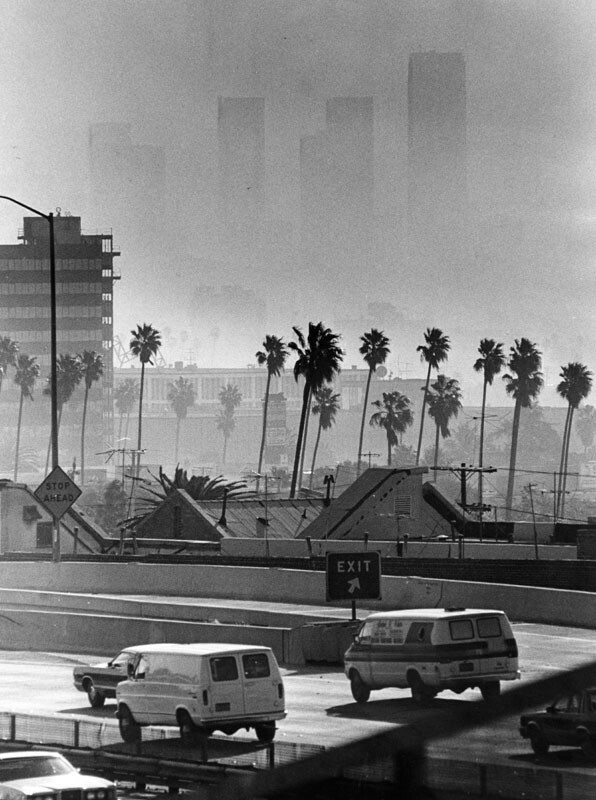 (1970s)* - View of downtown Los Angeles office towers, barely visible through the smog. Photo taken from the Hollywood Freeway. 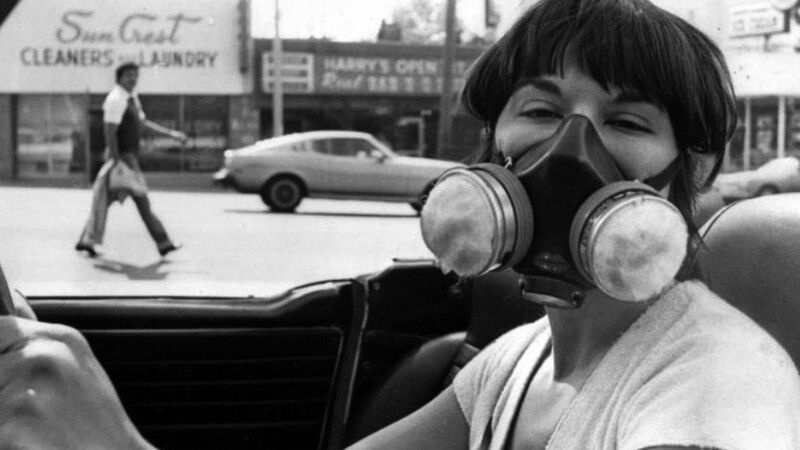 (1970s)^^ - A driver fights the smog in 1970s Los Angeles. 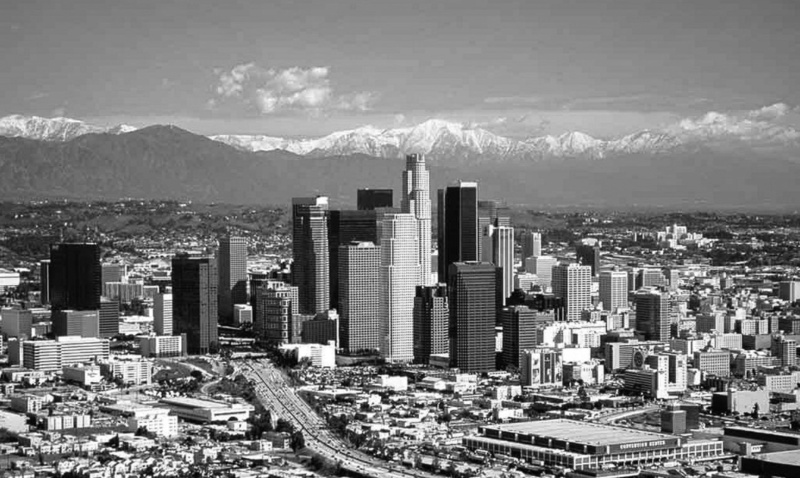 (1986)* - View of Wilshire Blvd. 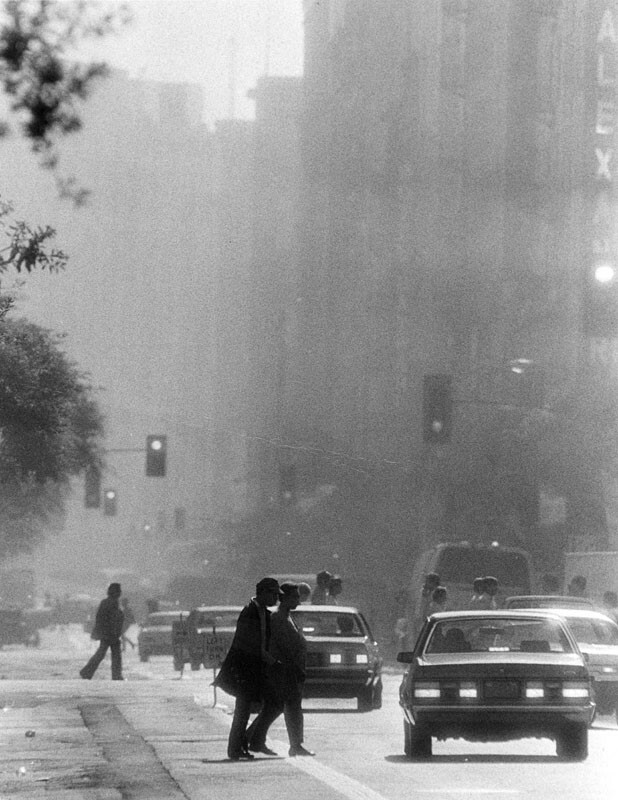 looking east from San Vicente at 11:30 a.m. on December 5, 1986, following five first-stage smog alerts. 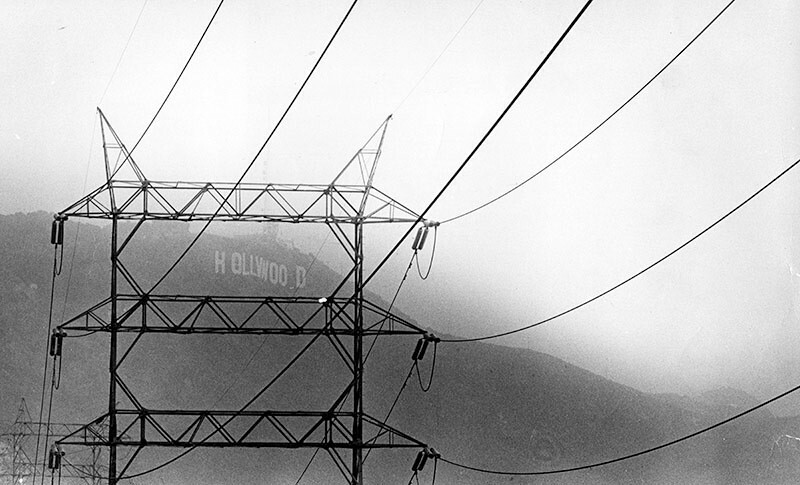 (1979)* - Photograph caption dated September 14, 1979 reads, "The Hollywood sign is barely visible through the smog in this photo taken from above Lake Hollywood in Cahuenga Pass." 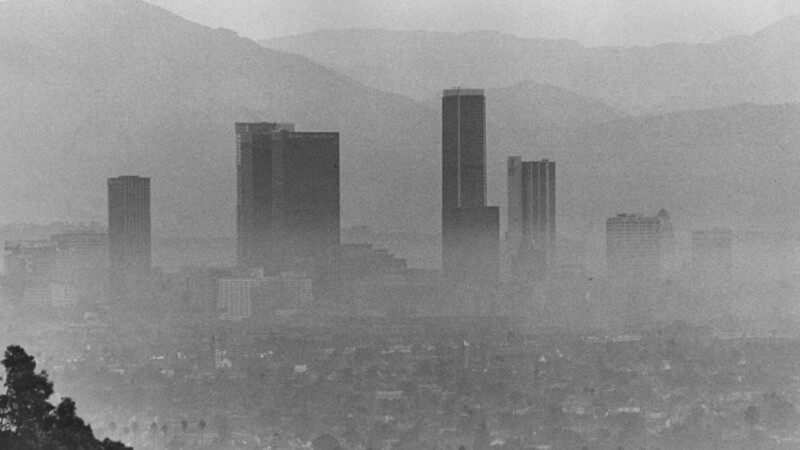 (1973)** - The tall buildings in downtown Los Angeles rise above a blanket of smog. (ca. 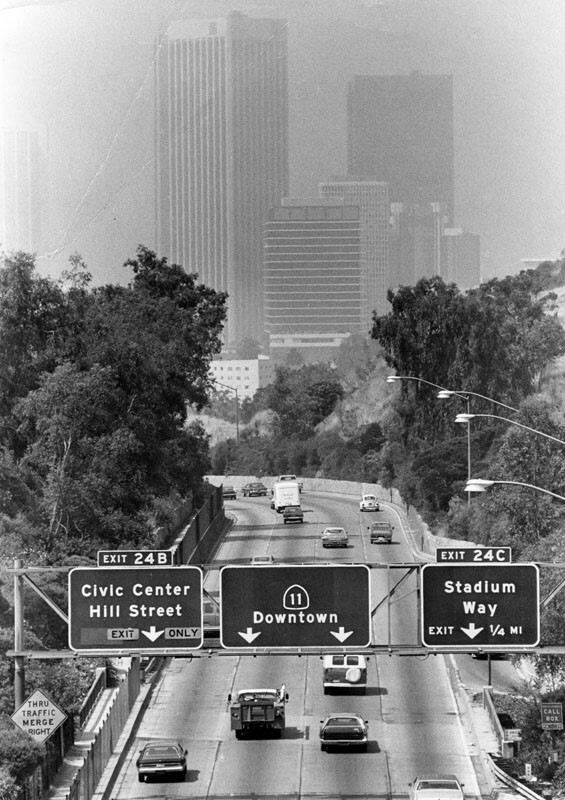 1979)* - View from Elysian Park looking south along the Pasadena Freeway from Buena Vista Drive about 11:00 a.m. 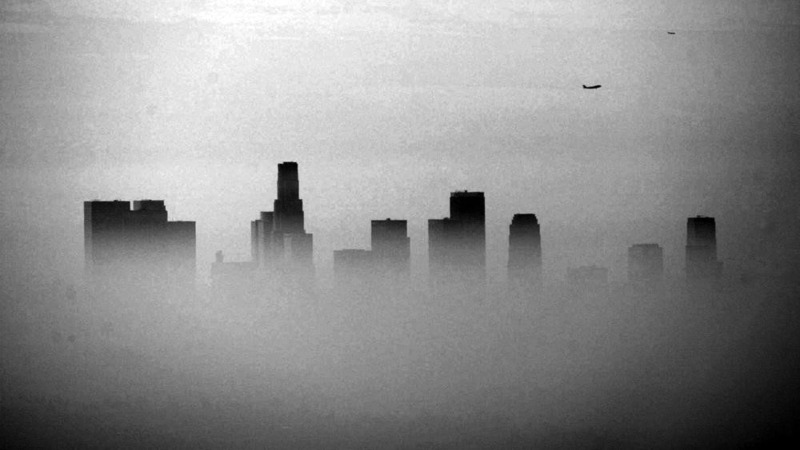 Downtown Los Angeles office buildings nearly disappear into the smog. 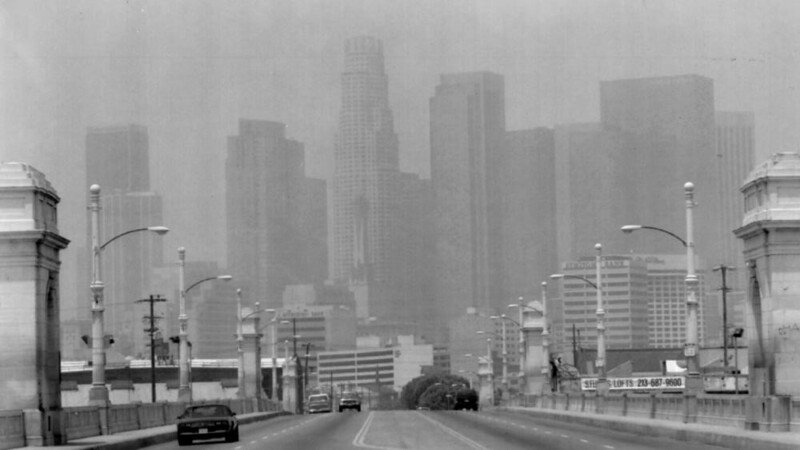 (1993)^^ - The Los Angeles skyline shrouded in smog as seen from the 1st street bridge in July 1993. In 1993, bowing to pressure to do its part to revive the sluggish economy, the AQMD approved a program that allowed major polluters to trade emission credits among themselves. The program, dubbed RECLAIM, proved ineffective and fed the agency’s soft-on-the-bad-guys reputation that continues to this day. 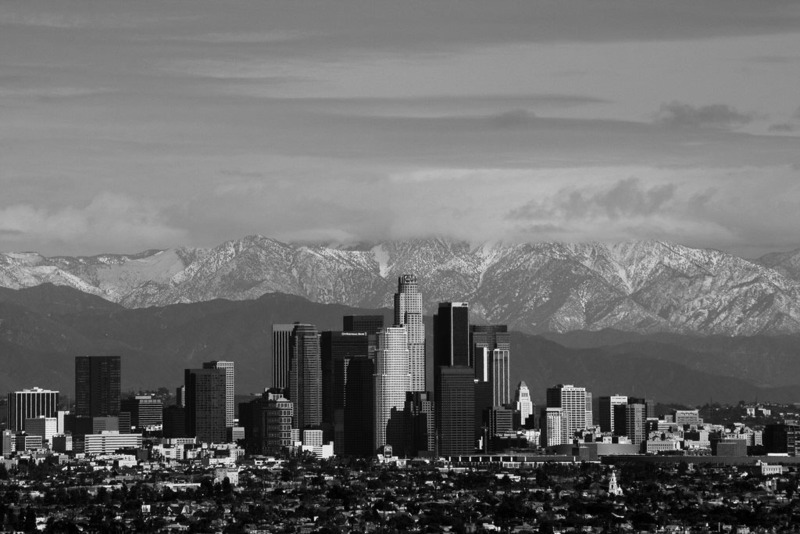 (2003)^^ – The downtown Los Angeles skyline peaks out above a layer of smog as seen from Griffith Park. In 1996, the ‘Big Seven’ automakers committed to make zero-emissions vehicles, and General Motors rolled out the EV-1. (2015)^^ – Downtown skyscrapers reflect the light from the setting sun as seen from more than 20 miles away on the Palos Verdes Peninsula. 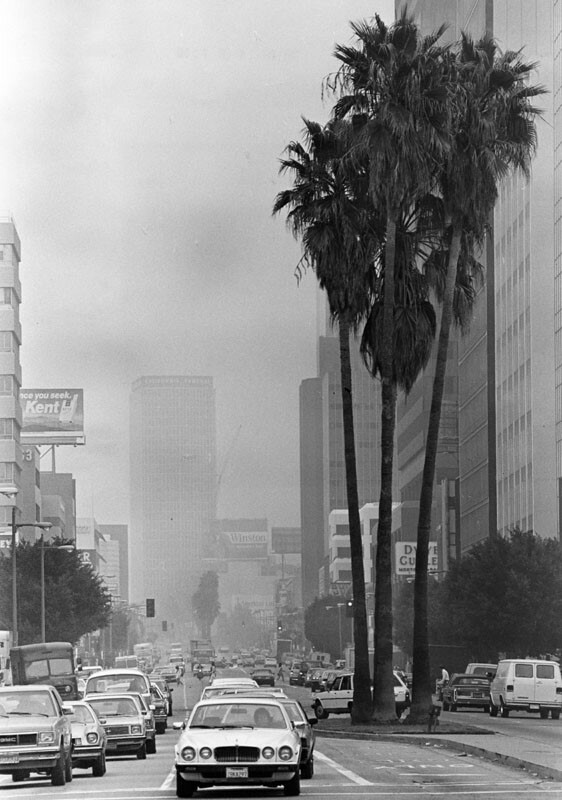 In the 1970s and '80s, the Los Angeles region often saw more than 200 bad-air days a year, with ozone levels exceeding 300 parts per billion on the smoggiest summer days. Peak ozone concentrations have dropped to about a third of that, even as the region’s population has grown and the number of vehicle miles traveled has doubled. Over the past several decades, California officials set groundbreaking standards that phased out many inefficient car and truck engines and some of the dirtiest fuels for everything from jet skis and lawnmowers to school buses and heavy-duty trucks. 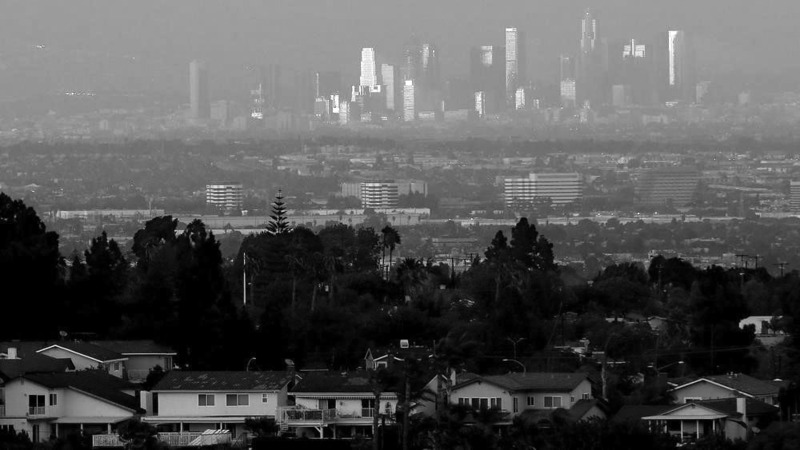 Local smog-fighters in the Los Angeles basin forced cleanup of oil refineries, manufacturing plants, and consumer products such as paints and solvents. Other local and state programs offered incentives for replacing old trucks and buses. Much more can still be done.